For a state with a tiny number of Amish, NC has a plethora of Amish furniture dealers, with around a dozen outlets dealing Amish woodcraft across the Tar Heel State. Furniture shoppers in Charlotte, Raleigh, Durham, Cary, Winston-Salem, Greensboro, Wilmington, Hickory, Asheville, and other NC cities can find Amish furniture in a number of locations. The “Amish furniture” category is broad. Amish furniture ranges from bedroom suites to kitchen cabinets to outdoor furniture. Amish create pieces for the office, dining room, living room–essentially every room of the home–even children’s furniture. This North Carolina Amish furniture guide also includes listings for businesses selling outdoor Amish structures. NC Amish cabinet retailer for Schrock’s of Walnut Creek (Holmes County, Ohio). Amish-made kitchen cabinets, custom bathrooms, as well as office, media room, and library furniture; custom entertainment centers. Cupboards, office chairs and desks, end tables, dressers, hutches, armoires, kitchen islands, ottomans, china cabinets, chests, sofas, and many more Amish-made furniture items. For more Amish furniture stores in the Asheville area, visit the Amish Furniture Asheville page. Amish poly outdoor furniture, cypress furniture, lighthouses and copper-top birdhouses, as well as Amish indoor furniture including dining room sets, bedroom suites, and entertainment centers. Amish-crafted home furnishings in Colonial and Primitive styles from Lancaster County, Pennsylvania. Also sells home decor items, candles, rugs, soap. The Amish House has gone out of business. Amish benches, cabinets, bureaus, beds, hutches, racks (quilts, magazines, drying), toys and more by Amish furniture makers in OH and IN. Also carries food, baked goods, wind chimes. Triad-area outlet of the Simply Amish network of Amish furniture makers. Amish gazebos, barns, horse barns. Also sells carports and trampolines. To locate Amish furniture outside North Carolina, the Amish Furniture main directory features full listings for Amish woodworking businesses across the US and Canada. Note to North Carolina residents: Please be sure to check opening hours of any Amish furniture businesses listed in this guide before traveling long distances. While we strive to keep this directory up-to-date, business locations and schedules can change. Not responsible for changes to information. The Tar Heel state has never attracted much Amish settlement, but for the past quarter-century one small Amish community has existed near the town of Union Grove, about a half-hour outside Winston-Salem. Amish in this community belong to a New Order affiliation. Though they dress plain, speak Pennsylvania Dutch, and use buggies, they also permit a higher level of technology than most Amish, making extensive use of tractors as well as having electricity in the home. 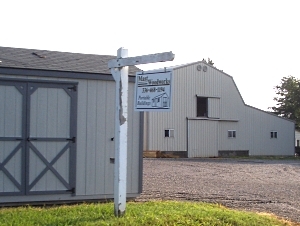 Amish at Union Grove operate a number of stores and businesses, including a pair of general stores, furniture makers, greenhouses, and more. Read more on Amish in NC. Craftsmanship -Amish craftsmanship is generally considered top-notch. Amish learn woodworking and other trades early, and often have many years of experience by the time they open their own furniture workshops. Quality materials -Solid hardwoods are commonly used in Amish furniture shops. Softwoods are used as well. Amish furniture is typically advertised as being free of veneer, pressed wood, and particle board. Amish have also developed a wide range of quality finishes to give furniture added protection and sheen. The durability of Amish furniture helps to earn it the “heirloom quality” label, as it is described by many retailers. Diverse styles -Amish furniture isn’t just plain and simple. Amish create furniture in a wide range of styles, including contemporary designs, and do custom work as well. Variety -Amish craft furniture for every room of the home, as well as outdoor furniture. “Amish appeal” -In a world of mass production and big corporations, buyers appreciate the chance to patronize and support a small family business. Amish themselves are well-regarded and their products perceived as high-quality and natural. Amish furniture makers also do a lot of custom work, crafting pieces to the specifications of the client. Custom work allows buyers to select the type of wood, style, as well as the kind of finish. Due to often-high demand, custom orders of Amish furniture often take a few weeks to a few months, or even more, to fulfill. NC Amish furniture shoppers have several options for finding Amish woodcraft. Though NC’s only Amish community, at Union Grove, is small, there are a number of Amish craftsmen creating both indoor and outdoor furniture pieces, as well as outdoor structures such as sheds and gazebos. Union Grove is reachable within a fairly easy drive from many major NC cities, including Raleigh, Greensboro, Charlotte, and Winston-Salem. Not all Amish sell their furniture retail, so check to be sure a given business is able to sell to the public before traveling long distances. A more convenient option for most furniture shoppers is to visit a North Carolina Amish furniture outlet, of which there are around 1 dozen across the Tar Heel State. NC Amish furniture stores allow you to browse for your particular piece, often in a comfortable and convenient showroom setting. Additionally, some Amish furniture retailers can arrange custom work through Amish craftsmen. Finally, you might just prefer buying Amish furniture online, which has the added benefits of convenience and access to a wide variety of furniture choices. I am looking for a wooden oak desk chair on a swivel base. I like the fan tail style or something simple. I live in Greenville SC and can pick up if not too far. My father passed away recently, leaving a gorgeous Amish bedroom set – oak with a red design. Set includes Headboard, Footboard (needs a piece of rail), 2 nightstands, triple dresser with mirror, and armoire. I very much wish this could fit in my own home, but I can’t make it work. Looking for consignment where this could go to someone who could appreciate it. Thanks. What we are really looking for is a mattress company in Raleigh area that is Amish owned and make. Good luck. We are actually inquiring about having 10’X20′ cabin home’s build on our property. We have a 7 acre farm. House, 8 stall red barn, and a big metal chapel building that we are finishing out. We want to build or have someone build cabins in the back of the property. We want to be able to house people on our property. We are almost finished with 3 bathrooms and an apartment built. We are christians and we love the Amish culture and community. Do you know who could help us with this? Depending on where you are in North Carolina you might be near a small Amish community. The only NC community is in the area of Union Grove in the western end of the state. There are a few communities in VA not too far from the NC border. Where can I get the foot board of our cannonball bed repaired? Once of the wooden peg holding a virtually decorative rail has been lost. I am wondering how much it would cost to have an oak table built with drawers under 4 setting spots and at each end with a expansion sleeve in the center. It would need to be a 6 person table before the sleeve is added and a rectangle shape. I am sorry to be so specific, but there is a French 1800s china cabinet I would love to match. If I needed to I can send a picture to match the color. Thank you for your time I hope to hear from you soon.